In latest Traders' Tip, author Vladimir Voznjuk shows a simple currency pair-trading technique that can be applied on any intraday timeframe. The indicator, however, does not come with universal or fixed thresholds. It's up to the trader to find the optimal thresholds on a by currency basis after optimization. Figure 1. 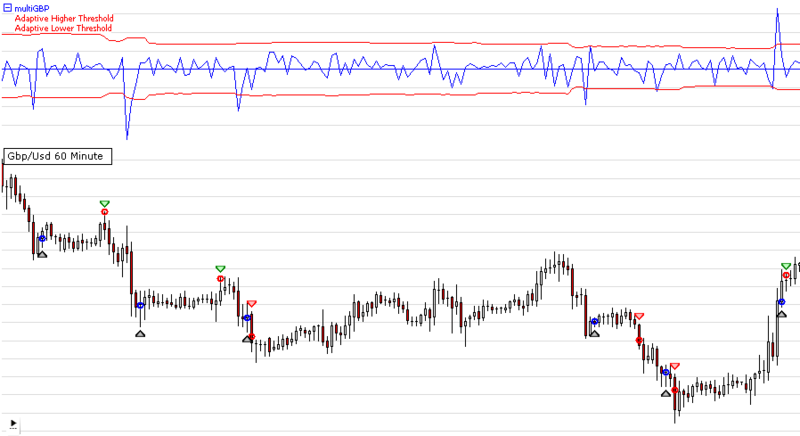 The 60-minute GBPUSD chart illustrates the application of the multiGBP indicator and the adaptive thresholds. To overcome this, you can use this simple technique (or a similar one): apply a Bollinger Bands with a sufficiently long-term period to the multi-level indicator. For example, a 100-period BB with 2 standard deviations might work well. In addition, these boundaries adjust to the volatility of the instruments and can save from frequent reoptimization.